Innisfree uses natural ingredients for most of their products. I have never seen any other brand using all natural ingredients for their whitening skincare line. Ingredients include Peppermint, Primula, Mallow, Lady's mantle, Speedwell herb, Balm mint and Yallow. These ingredients provides triple effect to whiten, moisturise and hydrate your skin! In addition, Arbutin brightens dull skin and reduces the appearance of dark spots. 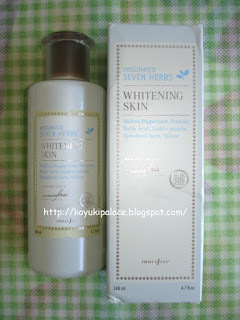 The price is a little expensive... compared to other whitening product brands, but it is acceptable.